sascha-egerer added a comment to T12804: Diffusion pre-redesign UI feedback (June 2017). T8442 would help a lot for those "I have to many repositories"
Save the search as "Phacility Repositories". Do you use this strategy today? How would T8442 improve on this? If you don't do this already, but dividing repositories by Space is useful, why don't you currently do it? Put another way, what problem exists with search today that T8442 solves but search changes could not solve? adam93 awarded T4026: Add relations between commits a Like token. sascha-egerer added a comment to T10725: Can't access binary files of differential revision. sascha-egerer closed mock M1469: Relation example. sascha-egerer updated the task description for T11619: Uploading an image in the Mock description does not attach it to the Mock. sascha-egerer created T11619: Uploading an image in the Mock description does not attach it to the Mock. sascha-egerer created M1469: Relation example. sascha-egerer added a comment to T11515: `arc ade` should do something. sascha-egerer added a comment to T11447: Make related object search more flexible. Ok sorry for that - that was a really bad example... The problem is that only complete words are found and not parts of it. So you'll get a result for "Hello" but not for "Hell". So searching for "Component" will give no result if the title is "Components". Is that correct? sascha-egerer created T11447: Make related object search more flexible. Herald updated subscribers of T9152: Plan Spaces v2. sascha-egerer awarded D15880: Move 'should render' logic to PhutilUnitTestEngine a Like token. sascha-egerer renamed T11352: arc patch with invalid revision number fails with an exception from arc patch with revision number fails with an exception to arc patch with invalid revision number fails with an exception. sascha-egerer created T11352: arc patch with invalid revision number fails with an exception. sascha-egerer awarded T5568: Support `.arcunit`, similar to `.arclint` a Hungry Hippo token. sascha-egerer added a comment to T10661: Can't create milestone. @CodeMouse92 yes the project has a subproject. But changing the policies as described above works around that issue. sascha-egerer added a comment to T10928: Remote branches of git mirror are deleted. sascha-egerer accepted D15861: Use more precise language to describe what mirroring is. I already thought that while writing the ticket ;-) That's the reason i added the last sentence to adjust the documentation. Maybe it would be good to know that this feature is using the git mirror function and may overwrite data of the mirror. sascha-egerer updated the task description for T10928: Remote branches of git mirror are deleted. sascha-egerer created T10928: Remote branches of git mirror are deleted. sascha-egerer updated the task description for T10886: Unpublished, unauthored inline comments in Pholio are incorrectly counted on the image badge. sascha-egerer created T10886: Unpublished, unauthored inline comments in Pholio are incorrectly counted on the image badge. sascha-egerer created T10865: Remarkup is not rendered in Pholio Application. sascha-egerer added a comment to T10731: Script-and-regex linter documentation does not make it clear enough that you really have to do what it says. The use of sh as it is written in the documentation is important. I've also added myself as a subscriber (even if i was auto subscribed because i'm the reviewer) but that doesn't change anything. Still no permissions. The problem can also be reproduced when clicking on Download Raw Diff in the interface. Files attached to other objects take on permissions of the object itself. So if you add a file to a restricted task, the restriction is also applied to the file. My question was what is the relation to User B and the Diff. Is User B a reviewer, a subscriber, or ... ? sascha-egerer created T10731: Script-and-regex linter documentation does not make it clear enough that you really have to do what it says. What's the relationship between user b and the patch, specifically? sascha-egerer created T10725: Can't access binary files of differential revision. sascha-egerer awarded M1461: Timeline / Remarkup Cleanup a Love token. sascha-egerer awarded D12198: Added ESLint Support a Pterodactyl token. Ok i found the reason for the problem. If you set Applications → Projects → Edit Policies → Default View Policy to Project Memebers i does not work. You can still create normal projects and subprojects but you can't create milestones. I think that is because milestones do not have members but the permissions are evaluated against the "project members". Yes I'm member of all those groups as described above. I'm also an "Admin"
I've posted a screenshot of my settings or do you need anything else? Yeah i did basically the same. What are the permissions of your project? sascha-egerer created T10661: Can't create milestone. sascha-egerer added a comment to T9293: WebSockets access problems with reverse SSL proxy . sascha-egerer added a comment to T8594: Develop system for dumping/backing up Phriction documents. @jhurwitz I use conduit to fetch wiki pages and format them with conduit to get a html syntax. I do that to add Wiki-Pages to a Frontend-Styleguide. Then i just add the required phabricator css and everything looks fine. So i think you can write your own simple script to do everything over conduit, right? sascha-egerer created T10582: Support colspan and rowspan in tables. sascha-egerer added a comment to D15025: fix bug. sascha-egerer added a comment to T5254: Allow top-level wiki doc to display entire document hierarchy instead of only 2 levels. Any progress here? What about setting the hierachy limit in the wiki document itself? So you can say "show X levels in the document hierachy of this page" where X is inherited and has a default value of 2? 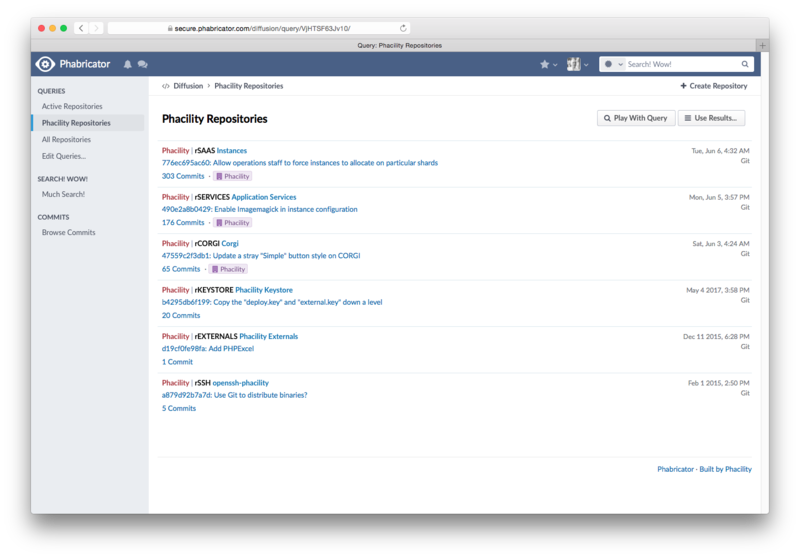 sascha-egerer added a comment to T9123: Build Phabricator in Harbormaster (v2). sascha-egerer merged task T8107: Current file is not highlighted in the filetree anymore into T8099: Mid-2015 Phabricator Redesign. sascha-egerer merged T8107: Current file is not highlighted in the filetree anymore into T8099: Mid-2015 Phabricator Redesign. sascha-egerer created T8159: Unit test and linter results are not accessible anymore if revision has been landed. sascha-egerer accepted rARCa4d33ef117aa: Use phutil_json_decode instead of json_decode. sascha-egerer retitled D12751: Fix broken ArcanistPhpunitTestResultParser from to Fix broken ArcanistPhpunitTestResultParser. sascha-egerer raised a concern with rARCa4d33ef117aa: Use phutil_json_decode instead of json_decode. sascha-egerer created T8107: Current file is not highlighted in the filetree anymore. sascha-egerer awarded rP0ae08b394cd4: Raise a better error for SSH access by users with no permission to use Diffusion a Like token. sascha-egerer added a comment to T7894: Give more specific error when git clone fails. Create a bot User that has Access to a Repository but not to Diffusion. Try to clone which will fail. sascha-egerer created T7894: Give more specific error when git clone fails. sascha-egerer added a comment to T5064: Make `arc land` run unit tests and lint. What about a configuration option runUnitTestsOnLanding that could be disabled, allTests, changedFiles? I don't see a benefit for running linters again as the comnination of 2 patches should not change any code style, right? sascha-egerer added a comment to D11515: Add configuration option for PHPUnit test dirs. That does also fix the problem that unit tests are not executed when doing an arc diff if they are not stored directly in the tests folder. johnny-bit awarded T7040: Create dependency for revisions automatically a Like token. sascha-egerer added a comment to T7071: PHPCS is broken. sascha-egerer added a task to D9034: PHPCS supports reading from stdin. : T7071: PHPCS is broken. sascha-egerer added a revision to T7071: PHPCS is broken: D9034: PHPCS supports reading from stdin..
oh ok... i can reproduce that on 2 machines. What's your OS? What's your php version? And you have this still applied? sascha-egerer added a comment to T7081: "Mark all notifications as read" dialog is behind overlay on iOS. A the same problem for logout. So you can't logout currently on iOS by using the standard interface. sascha-egerer updated the task description for T7081: "Mark all notifications as read" dialog is behind overlay on iOS. sascha-egerer created T7081: "Mark all notifications as read" dialog is behind overlay on iOS. sascha-egerer created T7071: PHPCS is broken. sascha-egerer added a comment to D9034: PHPCS supports reading from stdin..
sascha-egerer updated the diff for D11515: Add configuration option for PHPUnit test dirs. sascha-egerer retitled D11515: Add configuration option for PHPUnit test dirs from to Add configuration option for PHPUnit test dirs. sascha-egerer created T7040: Create dependency for revisions automatically. sascha-egerer awarded T4752: Daemons may not have permission to remove files from local disk storage engine a The World Burns token. sascha-egerer awarded T5064: Make `arc land` run unit tests and lint a The World Burns token. 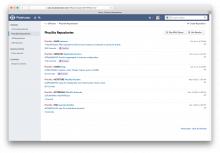 sascha-egerer added a comment to T5531: Dashboard with 3 columns. Should i create a Task for "Dashboard with 4 columns"? What about making the column amount flexible? sascha-egerer added a comment to T5212: Add browser notification support for Conpherence. These tasks are both not related to native browser notifications but to realtime Chat Updates. So i thought i create a new ticket. But if this will also Done in this tickets i'm Fine with that. sascha-egerer added a comment to T5211: Firefox has high CPU utilization when scaled background images (particularly avatars) are visible. sascha-egerer added a project to T5212: Add browser notification support for Conpherence: Conpherence. sascha-egerer created T5212: Add browser notification support for Conpherence. sascha-egerer awarded T4083: Implement support for automatically updating Conpherence when new messages appear a Love token. sascha-egerer abandoned D9135: Add function to merge 2 arrays by overruling the first. As already said in IRC I'll implement this function with a custom script and abondon this revision. sascha-egerer added a comment to D9135: Add function to merge 2 arrays by overruling the first. Do you have a better idea how to handle these configurations? sascha-egerer edited P1142 Array merge. This is e.g. usefull to merge a global configuration file with a stage specific configuration. Where do you want to use this specifically? I worry this won't be sufficient in the general case. If both configuration files have lists, sometimes those lists should be combined instead of overwritten, and other times they should be overwritten entirely. sascha-egerer retitled D9135: Add function to merge 2 arrays by overruling the first from to Add function to merge 2 arrays by overruling the first. sascha-egerer added a comment to T4752: Daemons may not have permission to remove files from local disk storage engine. Another approach might be to adjust the umask when we write stuff to the local disk engine. sascha-egerer awarded T4195: Implement pre-commit Herald rules a Love token. sascha-egerer closed T4121: Nooooo as Invalid. sascha-egerer edited this Maniphest Task. sascha-egerer raised the priority of T4027: Link commit header also to bugtraq url from to Needs Triage. sascha-egerer updated the task description for T4026: Add relations between commits. sascha-egerer raised the priority of T4026: Add relations between commits from to Needs Triage. sascha-egerer awarded T1344: Create the ability to show a Trello style view for projects. a Love token. sascha-egerer added a comment to T1344: Create the ability to show a Trello style view for projects..